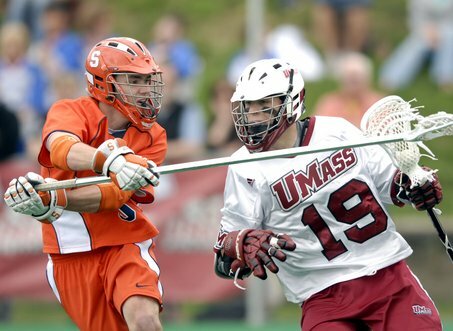 Since the UMASS LaxBacker’s inception in the fall of 2001, we are pleased to report that we have raised over $500,000 for the men’s varsity lacrosse program. Our alumni, family & friends have shown remarkable support for the program, which has resulted in a newfound pride for UMass Lacrosse and unprecedented success. Syracuse defenseman Evan Brady, left, pressures UMass attacker Tim Balise during the first quarter of their lacrosse game at Amherst on Saturday, April 28, 2007. STAFF PHOTO BY CHRISTOPHER EVANS. The UMASS LaxBacker Committee would like to thank all those that have contributed to the Annual LaxBacker Fund, expressing their true support of the program. With the remarkable support shown by our alumni for the LaxBackers over the last 15 years, it is obvious that we have just scratched the surface of potential for this organization. The Laxbacker funds offset costs associated to the TEAM – that are not covered by our operating budget from the University. You can make a difference in the current team’s experience at UMass by contributing to the LaxBacker Fund. Yearly membership fees will allow us to have a steady stream of annual revenue that will enable the LaxBackers to sponsor events each year for our players, families, alumni, and friends, while ultimately instilling pride and belonging to the program. In recognition of your $150/$175 membership fee you will receive the new UMass Lacrosse Gorilla t-shirt, admission to all home games (1 admission for single LaxBacker, 2 admissions for family LaxBacker), access to all LaxBacker sponsored events, and the UMass Lacrosse Alumni Newsletter will be sent to you via email every couple of weeks. Stay connected, pass the word on, and continue supporting UMass Lacrosse! !